Welcome to The Lookstein Center Bulletin Board! 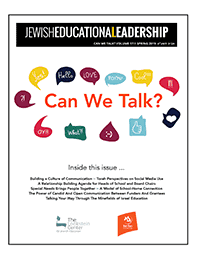 Complete the form below to post a resource or opportunity for Jewish educational professionals. Have a question? Contact info@lookstein.org. Members can log in and post for free. For more information click here. If you are publicizing a free service you may be eligible to post for free. Please contact info@lookstein.org for more information. We limit advertisement to 2500 characters; the first line appears in front Bulletin Board page so consider this when composing text. PLEASE NOTE: If Paypal payment does not go through, we will NOT be notified of your ad and it will not be processed. If in doubt, best to confirm with info@lookstein.org. Please Note: The Lookstein Center reserves the right to approve or deny the publication of any bulletin board posts. Payment for posts that are not approved will be refunded. Already a member and want to post for free?